The evening started on the wrong note for racecar driver Alex Tagliani who was forced to retire following a crash in the first of two NASCAR Pinty's Series 100-lap sprints held Wednesday evening on the 0.333-mile Wyant Group Raceway oval track in Saskatoon, Saskatchewan. 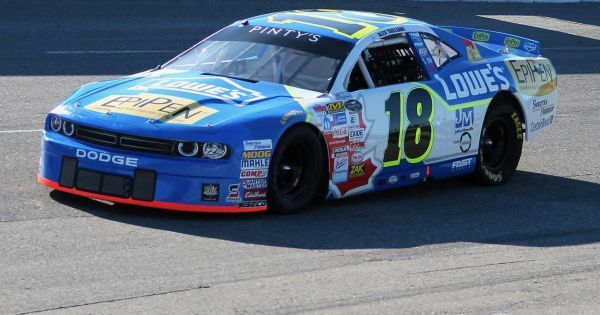 With only a two hour and thirty minute break between the two races, Tagliani Autosport managed to properly repair the heavily damaged #18 EpiPen-Lowe's-St Hubert- Spectra Premium Dodge in time for the second race. Starting eighth for race 2 of the Velocity Prairie Thunder Twin 100s presented by Bayer, Tagliani had moved up to fifth place by lap 59 of 100 when he was spun by Noel Dowler of Sherwood Park, Alberta, while trying to defend his position. The incident cost him 10 positions. However, the driver from Lachenaie, Québec, managed to work his way back to ninth position and finished only 3.3 seconds from race winner Cayden Lapcevich. DJ Kennington scored his second runner up of the evening ahead of Alex Labbé, winner of the first sprint. Twenty drivers started the race with 17 crossing the finish line, 15 on the lead lap. The race was under caution four times for 27 laps. One of the things Tagliani feared most in Round 6 was contact that could damage his car in the first sprint of the Velocity Prairie Thunder Twin 100s. On lap 65, Tagliani was collected after the field had tightened trying to avoid the spinning car of Ian Admiraal of Sherwood Park who had lost control on the front stretch in front of the field. Tagliani was forced to go behind the wall so his crew could start work on the heavily damaged front of the EpiPen-Lowe's-St Hubert- Spectra Premium racecar. Tagliani's race was over. Starting eighth, he was fifth when the incident occurred. In an overtime first sprint showdown, Alex Labbé held off a charging DJ Kennington to score his second win of the season. Cayden Lapcevich finished third ahead of Donald Theetge and Gary Klutt. Twenty drivers started the second race with 19 finishing and 15 on the lead lap. The sprint was under caution five times for 32 laps. "Of course, these are disappointing results," Tagliani said. "This is bad luck striking on a regular basis. In the first race, the car was amazingly fast and we were on a charge. Then, someone got out of shape and spun into the midfield. The driver tried to get back onto the track in front of the leaders, causing a ripple effect that forced everyone to abruptly slam on the brakes. I hit the rear of the car in front of me damaging the radiator. My race was over. "Because of the short intermission between the end of the first sprint and the start of the second one, the team barely had time to repair the front end before it was time to go again. Still, they did a great job to get it ready. The car was running very well despite the fact we were missing a few body parts in the front. While I was fighting for fifth place, there was a lateral contact that once again damaged the car and sent me near the rear of the field. Again, I charged back to finish ninth. Lady Luck was not on our side tonight. Six races are left on the schedule, and we are going to make the best of it so that we can finish on a strong note." A great points payout for some drivers like the trio of Labbé, Lapcevich and Kennington as the Twin 100s were scored as two separate events with full championship points for each race. Despite a DNF, Tagliani scored precious points to hold on to eighth place with 237 points, only three back of sixth held by JF Dumoulin. Kevin Lacroix is still first with 300 points, but his lead of 13 has shrunk to two points over Labbé. With a win and a third, defending series champion Lapcevich has moved up to third with 274 points, four ahead of Kennington. In 52 NASCAR Pinty's Series starts, Tagliani has five wins, eight poles, 19 top-fives and 32 top-ten finishes. The Velocity Prairie Thunder will air on TSN on Saturday, August 5 at noon EDT. Next stop: Edmonton. Following their two races in Saskatoon, the NASCAR Pinty's Series will conclude its Canadian Western swing in Edmonton for the eighth event of the 2017 season. The race will be held Saturday evening on the one quarter-mile Edmonton International Raceway located near Wetaskiwin just south of Edmonton, Alberta. On tap for the one-day affair, a 60-minute practice session to start at 12:45 p.m., local time, followed by qualifying at 4:05 p.m. The green flag for the Luxxur 300, a 300-lap (121 kilometres) with a five-minute break near lap 150, will be waved at 7:30 p.m., Mountain Time (9:30 p.m. EDT). Two of Tagliani's five wins in the NASCAR Canada Series came in Edmonton. Last year, the driver from the suburbs north of Montreal, took the lead on lap 88 and never looked back on his way to scoring his final victory of the 2016 season. His first series win came in 2008 when the race was held at the Edmonton City Centre Airport temporary road course. Since 2014, Tagliani has also held the series track record for pole qualifying at Edmonton Raceway with a fast lap of 12.514 seconds at an average speed of 115.742 kph. The second half of the Canadian Western tour will once again be a busy affair for Tagliani who will be back at work in Edmonton on Friday, July 28 with an early morning media tour followed by three meetings with his fans and sponsors. First on his sponsor's tour is a visit by Alex and his Tagliani Autosport team to the RONA store located ay 340 Baseline Road in Sherwood Park (T8H 2J2) from 9 a.m. to noon (Mountain Time). Later that day, the whole team, including Alex, will be visiting the new Lowe's Edmonton North store at 9603, 165th Avenue NW in Edmonton (T5Z 3X3) to meet with fans and customers from 2 p.m. to 4:30 p.m.
For those who may have missed the first two rendezvous, every one is welcome to attend the Fan Meet and Greet with Alex Tagliani at the Wyndham Garden Edmonton Airport located at 8016 Sparrow Drive in Leduc AB. Tag and his team will be there to meet fans between 5 and 7 p.m. Fans and media are invited to attend these local pre-race activities and meet with Alex Tagliani who will answer questions, pose for photographs and sign autographs. During these events, Lowe's Canada joins with EpiPen to promote emergency treatment of anaphylactic reactions, which can happen when some people are exposed to a usually harmless substance called an allergy trigger. EpiPen, another major sponsor of Alex Tagliani, manufactures EpiPen® Auto-Injectors for the emergency treatment of anaphylactic reactions.